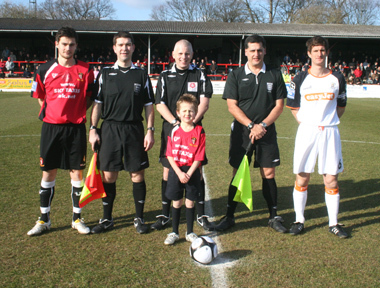 Hayes & Yeading's forward options were fully stretched as Luton Town came to Church Road for this Blue Square Premier clash. Manager Garry Haylock was unable to field Luton loanee Steve Basham against his parent club while top scorer Scott Fitzgerald had not recovered fully from his injury received in the victory over Gateshead. This left Craig Watkins leading the attack with Daniel Wishart as forward back-up from the bench. The visiting Hatters made a strong start, dominating possession in the opening twenty minutes although during this time Clark Masters in the United goal was barely troubled. In fact the 21st minute saw the first real opening of the game and it came in the visitors box where a Justin Cochrane pass found Craig Watkins but sadly his touch was a little too solid and Luton keeper Mark Tyler was able to grab the ball before the United man could connect. Two minutes later United fell behind. Keith Keane sent across a free-kick from the left touchline that Masters failed to connect with leaving an easy task for Hatters striker Liam Hatch who headed home at the far post. United could have hit back almost immediately when a Ram Marwa throughball found Dale Binns on the left side of the Luton box but his quickly taken shot was well held by Tyler at the foot of the post. Play immediately switched back to the other end and Masters gathered comfortably as Jake Howells tried his luck from just outside the area. Five minutes later the hill that United had to climb became mountainous when a slight nudge on Claude Gnakpa on the edge of the area saw the Luton man tumble to the ground and the referee's assistant flagged for a spot kick that was duly awarded by referee Bull. Gnakpa himself stepped up and easily beat Masters, sending the United keeper the wrong way. The final chance of the half came just a couple of minutes later when Keane fed the ball to Asa Hall whose shot from the edge of the United area swung well wide of the far post. Hope of an early fight back by the home side were almost dashed within seconds of the restart when a backpass to Masters saw the keepers kick blocked by Matthew Barnes-Homer but thankfully the ball ricocheted well wide of the United goal. The Hatters continued to push for the killer third goal, Barnes-Homer found Gnakpa who tried his luck from range but his left foot shot curled wide of the target and then just four minutes later United were right back in the game. A quick throw on the left side found Binns who pulled the ball back to Justin Cochrane who advanced before curling a perfect shot across the face of the diving Tyler and into the far corner of the Luton net. Far from United being buoyed by getting back into the game, it was the visitors who took over control of the game once more. Hatch broke away into the United half and having sweetly turned Ed Harris he advanced as one of three Hatters against a lonely Adam Green, thankfully for United the Luton man picked out an unmarked Barnes-Homer who only succeeded in placing his shot straight into Masters' midriff. Shots continued to come from the visitors, Hall fired over from 20 yards with Masters well off his line before Hall produced a neat knock down to Gnakpa but again his effort was too high to trouble the United goal. Masters was needed at the mid-point of the half though as Gnakpa, substitute Tom Craddock and Hall combined and the latter forced a diving stop from the United keeper who did well to push the shot away. What must have seemed like the inevitable third Luton goal came on 74 minutes courtesy of a huge slice of luck. Gnakpa fed the ball inside to Craddock who hit a drive that Masters looked to have covered before a deflection off Green saw the ball bypass the United keeper and fly into the net. With ten minutes left United suffered another close shave as Jason Kovacs rose highest to a Keane corner, his headed effort being played off the line by the well placed Binns. United continued to press for another and Binns should have done better when a Toby Little cross was dummied by Sami El-Abd and the ball fell nicely to the wingers favoured left foot but he pulled his shot wide. Hopes were again raised in the home camp with two minutes to play when skipper Tom Cadmore met a Little corner and headed home past the unprotected Tyler to reduce the deficit to a single goal. Indeed United almost snatched a point in stoppage time when Watkins advanced onto a Harris throughball, held off the challenge of Kovacs only to be denied by Tyler who was smartly off his line to smother the United striker's effort (above). 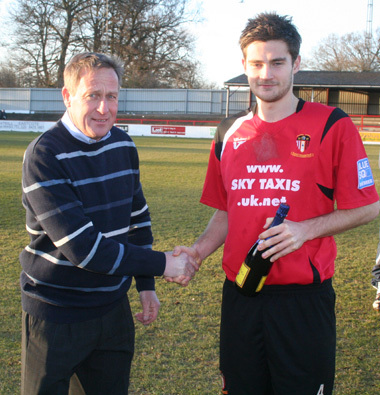 Sponsors Man of the Match: Tom Cadmore.